Michael and I started our Key to Wine Country Weekend with a Vineyard Tour at Riverbench Vineyards with the Vineyard Manager Rawley Hermreck. We arrived way early (I read 10 am and it was actually 11!) and actually beat Laura, the tasting room manager in. Really it was a happy accident though, Michael had time to take some great morning shots around the tasting room and vineyard and we relaxed in the garden listening to the birds. The birdsong was really amazing. Riverbench is located in the Santa Maria Valley on Foxen Canyon Road. 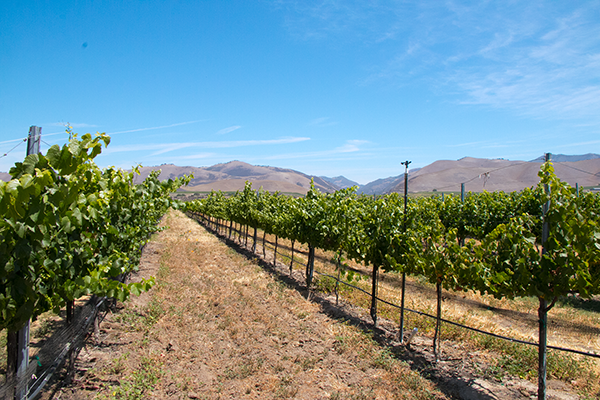 The vineyard established in 1973 planted Pinot Noir and Chardonnay and made a name for themselves as growers of these varieties. 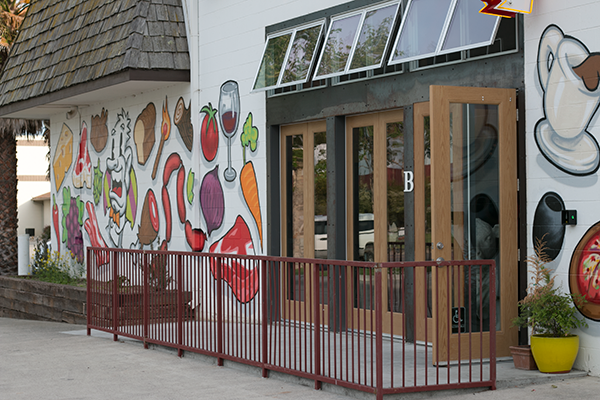 In 2004 the property was purchased by a group of local families, who shortly thereafter began producing their own wine. In addition to Pinot Noir and Chardonnay they now grow Savignon Blanc and Albarino. 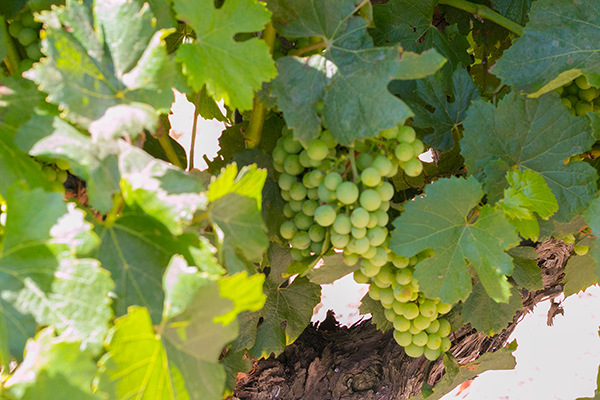 The majority of the fruit they grow is still for other wineries and winemakers. The Albarino is for Kenneth Volk who is just a stone’s throw away. Rawley just took over for long time Vineyard Manager Jim Stollberg this year, but he’s part of the family (he’s the son of owner Randy Hermreck) and he has extensive farming experience and a degree in viticulture from Cal Poly, and from our walk with him, you can tell he has a great love for these vineyards. Rawley started by walking us out to the Chardonnay block out front. Block 37 was one of the original blocks and these vines are indeed 41 years old. The style of trellising here is known as California sprawl. This is a Simple Curtain two-wire vertical trellis and is typically used when the anticipated vine vigor is moderate to high. There is a wire for the cordon and a higher wire that is for the foliage support. The rows here are at 12’ spacing. They do a beautiful Blanc de blanc sparkling wine from some of this Chardonnay. We headed across the driveway to the back of block 38 to look at some of the Pinot Noir planted there. Here the trellises are Vertical-shoot positioned and Rawley showed us how the upper wires could be repositioned. We talked about frost protection. They did a little frost protection this year as a preventative measure, but luckily did not have any frost. They use oils and mixed chemistry to keep mold and mildew down and luckily this area never gets warm enough to have to worry much about mites. They do have gopher issues and have Owl Boxes and Raptor Perches. Owls make for great rodent control. You put up the boxes and the owls fly in. 1 owl will catch 1 gopher per night which really helps keep the gopher population down. Owls are not territorial like raptors, so you can put up multiple owl boxes without a worry. We talked a little about handpicking as opposed to machine picking. Labor is becoming very hard to come by but the machines require a certain amount of space between the rows and they run a quarter million each. The machines are usable year round with attachments for picking, disking, spraying, mowing, and pre-pruning. Rawley watches the machines all the time over on the other side of the river up on the bench at Kendall-Jackson. As for how they harvest: they basically shake the berries off of the stems, so this doesn’t work for winemakers who want whole cluster presses or stem inclusion. The berries are shaken onto conveyor belts and then into baskets. The front area of the block by Foxen Canyon road had been pulled out and was scheduled to be replanted the following morning. 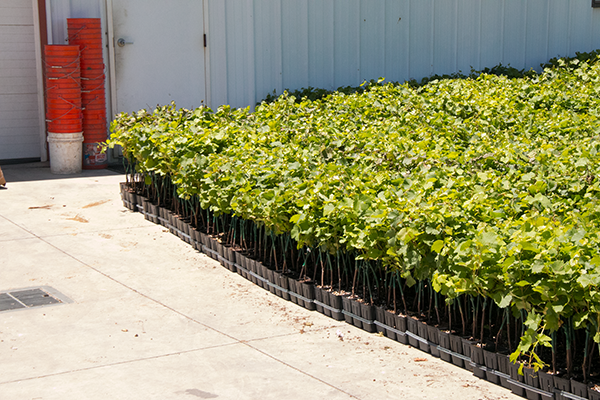 Rawley took us around back to show us the 9000 (yes 9000) baby vines that were waiting to be planted. I have seen dormant vines before waiting to be planted, grafted onto their rootstock, but this was new to see green potted vines. They all had green wax around their centers to protect the graft. Rawley’s nursery guy had designed a new kind of pot for the baby vines and convinced Rawley to try some in these new containers. Rather than being the short square pot like the kind you get on your vegetables at the nursery, these new pots were tall and thinner. They had holes on the sides, which kept the roots from growing out through air exposure. These new pots allow the tap root more room to avoid “j-root” (when the root reaches the bottom of the pot and turns back up). Rawley will see how they do compared to the other pots! We actually stopped by the next morning to watch as they were planting these vines. At this point it was time to grab Sadie, Rawley’s black Labrador and head into the back garden to put wax seals on some Pinot bottles. This evidently is Rawley’s job. 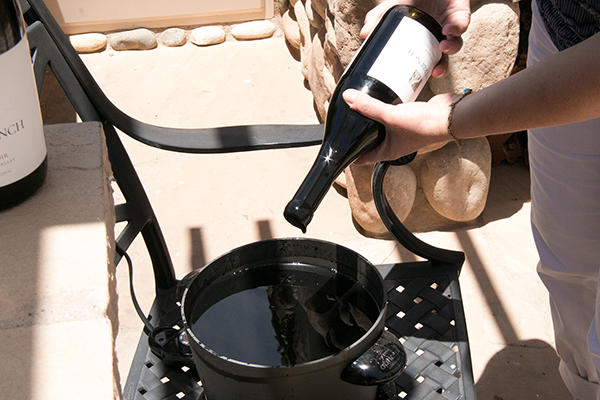 Each bottle of Pinot from Riverbench has a wax top and is hand-dipped. It’s a simple but focused process and Rawley demonstrated before he let me have a go. You begin with what looks like a crock pot filled with the melted wax. 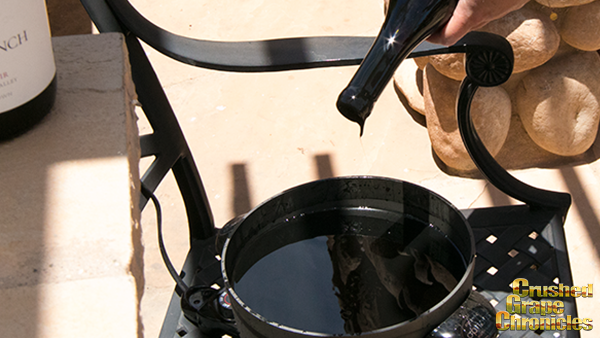 Hold the bottle with your thumb over the center of the label and dip the bottle into the wax at a 45 degree angle. Make sure to allow the wax to reach the point on the neck of the bottle where the wine would come to when the bottle is standing upright. When you pull the bottle out, begin spinning the bottle and the excess wax will start to drip back into the crock pot. As you continue turning you gradually get the bottle to completely vertical. When it is done dripping you plunge it into a bucket of water to cool it and seal it. It was pretty fascinating and concentrating work, and I decided that Laura would have to put this bottle aside for me to purchase after lunch. Laura then brought out lunch for us to enjoy with Rawley & Sadie on the back patio. We started our tasting with lunch with the Blanc de Blanc which is a lovely dry sparkling wine and was refreshing after our walk. 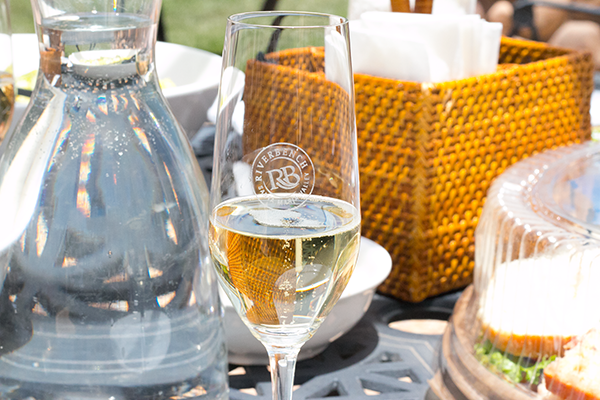 We enjoyed the 2013 Rosé, the 2012 Estate Chardonnay and 2011 Estate Pinot Noir and finished with the 2013 Reisling. Paired with the salad & sandwiches as we listened to the birds and talked Rodeo with Rawley it made for the perfect lunch. 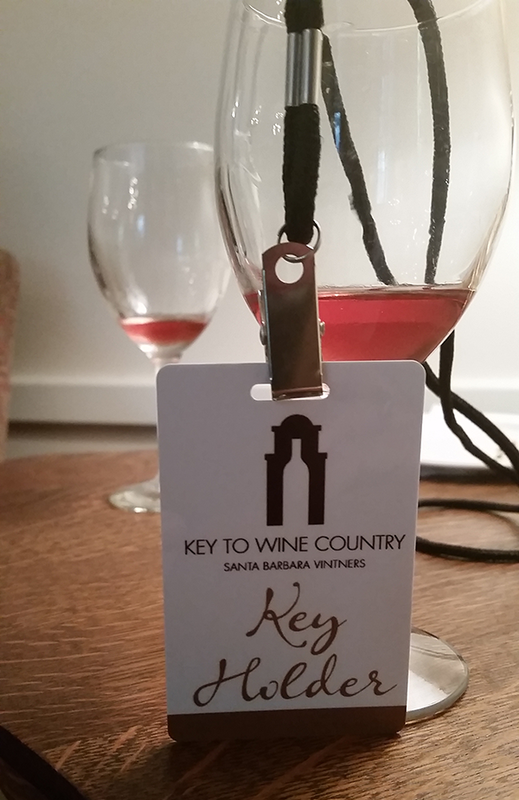 The “Key” to Wine Country – an inside perspective on what Santa Barbara Wine Country is all about. 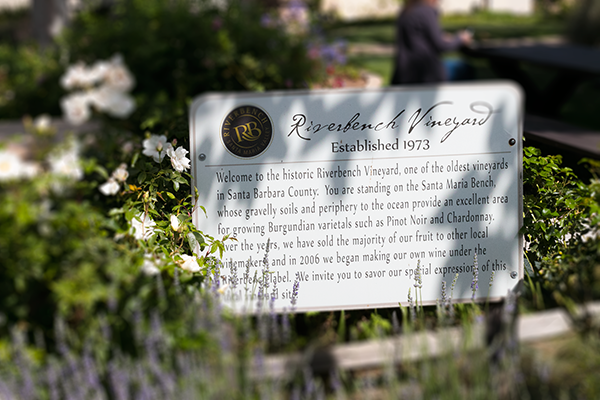 Our Key Weekend began in the Santa Maria Valley at Riverbench Vineyard with a vineyard walk on Friday morning with Rawley Hermreck the Vineyard Manager. Rawley walked us into the vineyard and explained the planting and trellising techniques that they use. We were able to see the new vines that would be planted the next day in the front block (watch for some pictures of this process!). Laura the tasting room manager set us up to learn how to dip their pinot bottles in wax for the beautiful wax closure, and then we enjoyed lunch on the back patio with Rawley and his dog Sadie complete with a tasting of the Riverbench wines. They have a sparkling program and the Blanc de Blanc was really lovely. Of course I left with that bottle of Pinot I dipped! 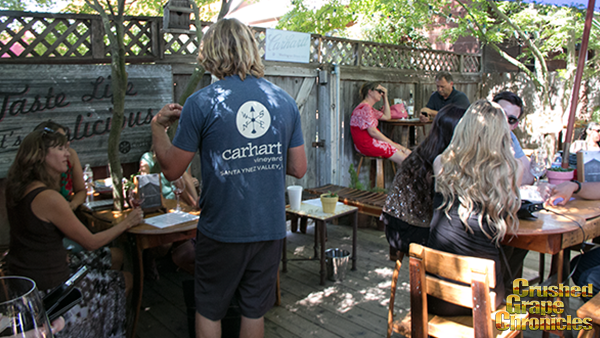 We had some free time before our next event and spent a little time wandering in Los Olivos, ending up in the tiniest tasting room and enjoyed the casual laid back atmosphere at Carhartt. 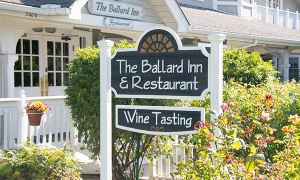 Our next event was the Larner Winemaker Dinner at the Ballard Inn. 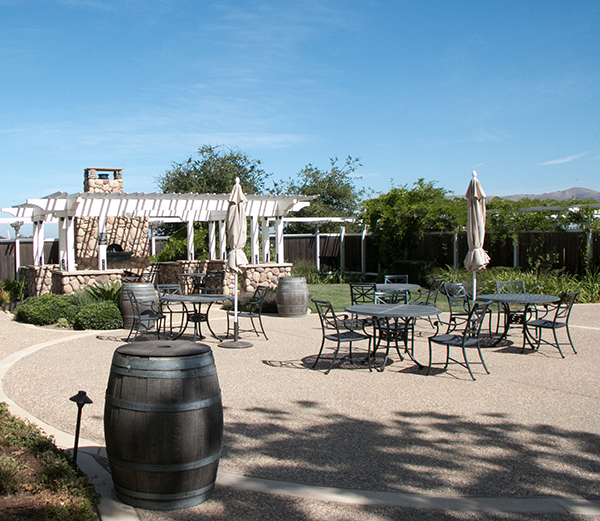 The Ballard Inn is a beautiful spot just south of Los Olivos. Chef Budi Kazali is also the owner of the the Inn, purchasing it in 2004. He blends Asian and New French styles with fresh local ingredients to create some captivating dishes. 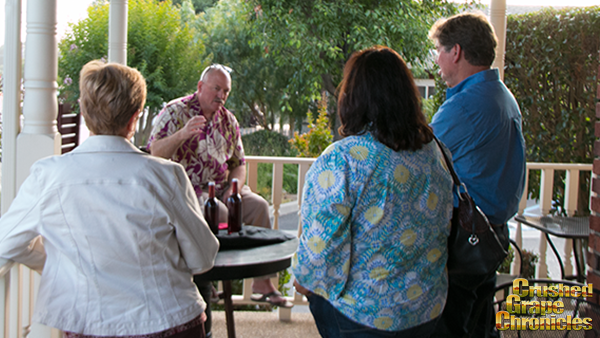 The evening began at 6 pm with Michael Larner pouring his Rose as well as the Malvasia Bianca and guests relaxed in the parlor or on the porch, watching the sun start to dip and the trees start to glow. Passed hors d’oeuvres kept our stomachs at bay as we waited for the main event. 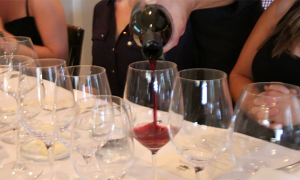 The pairings were beautiful and the intimate dining room made for a singular experience. Watch for the full blog post on this incredible evening as well as our series of conversations with Michael Larner. Saturday our day began with a unique event at Presqu’ile Winery in the Santa Maria Valley. Presqu’ile gathered 4 winemakers, including their own Dieter Cronje, to taste through wines made from grapes from the Presqu’ile Vineyards. 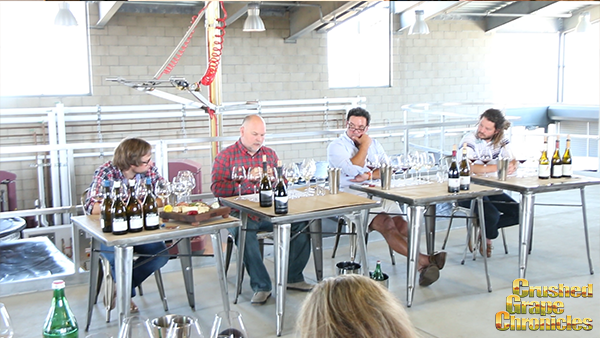 On hand were Ernst Storm of Storm Wines, Kevin Law of Luceant Luminesce and Ariki Hill of Labyrinth. We tasted through 9 wines doing side by side comparisons and listening to the winemakers discuss their winemaking techniques and unique aspects of each vintage. The event took place on the crushpad of the winery, high above the tasting room in this gravity flow space. Matt Murphy, President of Presqu’ile is warm and welcoming and kicked off the event with an introduction and welcome. This was a fascinating journey to taste the differences in these wines and search for the underlying commonality that the soil and the site bring. It was truly an amazing event for a wine geek! I was in heaven and took page upon page of notes! Of course the atmosphere was stunning as you looked to the panel sitting next to the railing that looked down on the winery floor, the glassware, the charcuterie laid out with such care and the attentiveness to warmth and hospitality… it was a beautiful event. We had to dash out sooner than I would have liked so that we could make it to Buellton for another unique event. 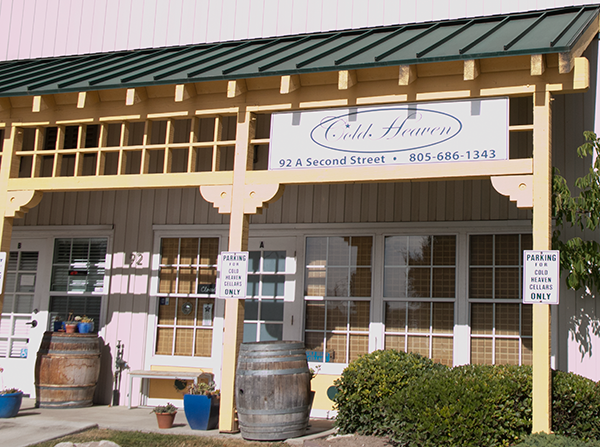 Cold Heaven Cellars was holding a “Rhone Scentual” event. We arrived at the Buellton tasting room and were greeted by Kara and Liz. 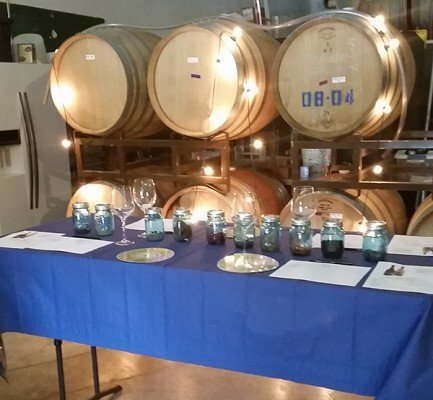 In the barrel room they had 2 tables set with tasting wheels, sheets for notes and lovely blue mason jars each filled with a different item to spark your aromatic senses. We began with the white wines (Viogniers of course!) and while we were all a little shy at first, this quickly became a case of grabbing for jars and then wanting to share the fragrance with the people around you. Conversations were animated and we all found that we were smelling things in a new way and with much more thought. 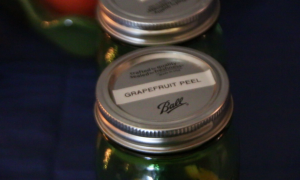 It was a discovery each time you opened a jar. Kara and Liz had samples of diatomaceous earth, white pepper, white flowers, fresh peaches, grapefruit peal and so many others. For the Reds at the other table they had chocolate, leather, fresh berries, cinnamon, just to start, I can’t remember them all! This was really a wonderful experience and Kara was there every step of the way encouraging you to make more discoveries and talk about other fragrances that you found in your scent memory. This event, broke down those barriers of intimidation from tasting notes. You may think that you can’t smell the habanero on that wine, but once you dip your nose in that jar, your memory is sparked and you can find it! Those tasting notes aren’t really as crazy and out there as people sometimes think. It’s just a matter of creating those scent memories and keeping them active! With a little time to kill before the evening event, we headed to Industrial Eats for lunch. Mention Industrial Eats to anyone in the valley and you will get the same response. People will often close their eyes briefly, envisioning the last thing they had there, and then will animatedly tell you about the amazing things you should order there. We had attended the Sta. Rita Hills AVA dinner here back in April and were excited to go try some wood fired pizza for lunch. The tables are long community tables allowing large groups to sit together or smaller groups to make new friends. The food here is phenomenal and the service is great. Don’t miss stopping here! 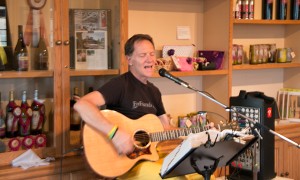 Campbell performed “every song you know by heart (almost).” (really, I could sing along with everything!). Lyndee Rankin had great food set out to accompany the wines and you could wander and sip as you enjoyed the “En Plein Air” paintings by Robert Karl Vogel, landscapes and cloudscapes of California and the Sierras. Also sculptures by Blake Rankin, (son of the winemaker) dotted the tasting room. The centerpiece for the gallery is a sculpture called Wings, which is the inspiration for one of his father’s wines. Ross’s wines are unique in that he believes in aging his wines before release. We did get to taste his new (Barbera)? which he created specifically to have a wine for a quicker release. It was a lovely evening with the art, music and wine inspiring great conversations among the varied guests. Watch for a video blog with insights from Ross on his wines! I unfortunately had to fly home to Vegas, so Michael enjoyed the Sunday Vineyard Hike and Farm-to-table lunch at Buttonwood Farm Winery & Vineyard without me. So here…I’ll turn it over to him. where we were treated to a chef Demo by Pascale Beale and tasted various wines with fresh from the farm Salads. We will have a more complete Blog post and video on this adventure at Buttonwood. This is a must stop, to see the combination of Farm and Vineyard. 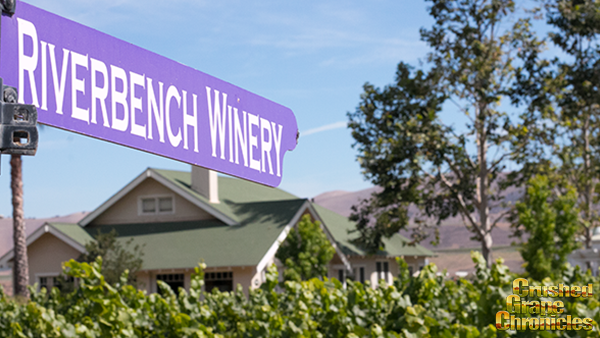 If you can visit this Fall while they are doing their Harvest Tour, it should not be missed. Stay Tuned, in the next couple of weeks we will be Posting Blogs and Videos on this amazing Weekend. We will also be launching a Ballard Canyon Series, with Interviews with Michael Larner of Larner Vineyard & Winery, and Steve Beckmen of Beckmen Vineyards. This will be a 4 week Series starting July 7th 2014. We will also be at the Wine Bloggers Conference in July to talk to with more winemakers and hear more stories from Santa Barbara. So you can expect more information on this incredible region for wines.